Everyone can be successful in music and enjoy it. It fosters creativity, expressiveness and appreciation of beauty. Grows the creative side of the brain, unique to the arts. Uniforms cleaned once over summer, other cleanings are responsibility of the student. Concert uniform includes a pair of black dress pants, ALL BLACK shoes and socks and a tuxedo shirt which will be ordered in October through us for about $16. Ladies will be given a dress and should wear black hose and shoes. You won't hear the end of this... Students playing on a beginner horn will find it harder to do what we ask them. Playing an intermediate or professional instrument matters. It's like a calculator-yes you can still add, multiply, divide, and subtract on a basic calculator in High school, but you need all the other functions of a TI-84 when you get to High school math. Students have proven they are going to stick with it-if possible try to reward them with an instrument that plays and sounds better. Talk to a director before you buy!! We want to help-it's a significant purchase! Our main student fundraisers are Poinsettias, Manna Cards, Cheesecakes and Coffee. Poinsettias are a HUGE fundraiser for students, so it would be good to get involved with this. If you can help out, please do-we depend on parents to make this run! Manna cards are another way to make money, consider taking advantage of this program. Best way for a student to improve on their instrument. Offered at school during lunches, study halls, before and after school. Cost is $24-$26 for a half hour lesson. We have been invited to perform in the New Year's Day Parade in PARIS, FRANCE!!! This trip will take place at the end of 2016 and New Year's 2017. The parade route is incredible. The trip will be an 8 day trip and will cost about $3000-$3200. All marching band students are invited to participate. The trip has not been officially approved by the board, but they have supported these trips in the past. We are letting you know now so you can plan. We will be having a meeting as soon as the trip is a GO! 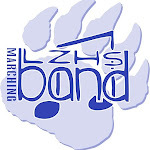 BBLZ is an organization for the purpose of supporting Lake Zurich Bands and families. They raise funds to provide scholarships, commissioning musical pieces, organize volunteers, plan events, and provide support to the directors. This group has become an essential organization for the success of our Band! Friends of BBLZ is a program that we are growing to allow Alumni and Community Members to support the band in a meaningful way. You will hear much more about this program this year. Please consider becoming part of BBLZ and help make the band stronger!